Is The VIX-'Tail' Wagging The Bitcoin-'Dog'? The recent 'triple-low environment' of low interest rates, low spreads, and low volatility gave birth to new asset classes like implied volatility (ETFs selling volatility), and cryptocurrencies. Deutsche Bank has begun to monitor these indices closely as new frontiers of risk-taking. 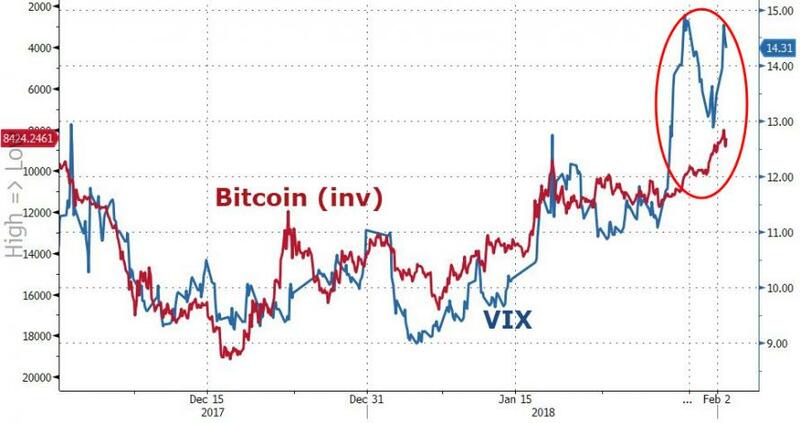 The prices of both asset classes have plummeted and rebounded simultaneously, and in 2018, correlation between Bitcoin and VIX has increased dramatically. First, implied volatility. Implied volatility is an index calculated from the price of a derivative product (options) of an underlying marketable security. However, we now have a “tail wagging the dog” situation where the price of the derivative product is feeding back into the price of the underling marketable security. Next, cryptocurrencies. Cryptocurrencies are closely watched by retail investors, affecting their risk preferences for stocks and other risk assets. Although institutional investors recognize that stocks and other asset valuations may have entered bubble territory (US equities’ average P/E is around 20x), they cannot help but continue their risk-taking. Now, a growing number of institutional investors are watching cryptocurrencies as the frontier of risk-taking to evaluate the sustainability of asset prices. 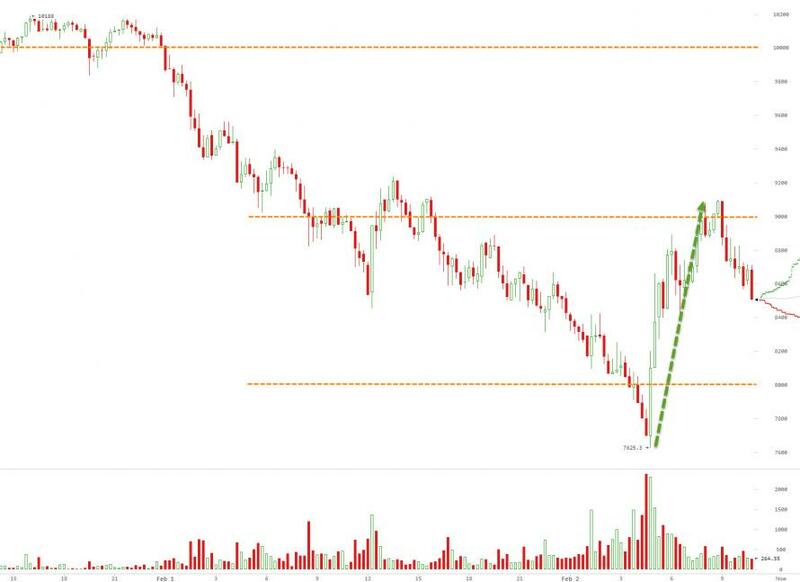 The result is that institutional investors, who are supposed to value assets using their sophisticated financial literacy, analysis, and information-gathering strengths, are actually seeking feedback about the market from cryptocurrency prices (which are mainly formed by retail investors). We believe the correlation between Bitcoin and VIX can increase as more institutional investors begin trading Bitcoin futures. And as we can see today, implied volatility (VIX) is feeding back directly into the prices of Japanese stocks and Bitcoin... dragging them both lower. Last year, cryptocurrencies experienced “melt-up,” a situation where prices surged, irrespective of fundamentals, because a flood of investors seeking capital gains outstriped supplies. If the current “triple-low environment” persists, and inflation rate and the likelihood of a recession remains low, we believe this “melt-up” phenomenon could spread to other products, creating massive asset bubbles. On the flip side, Deutsche warns that predicting the timing of an asset bubble’s collapse is fraught with difficulty. Investors required to seek out high returns, even in the current “triple-low environment,” are under pressure to manage assets near their fund’s value-at-risk (VaR) upper limit (CTA, macro funds and volatility-targeting funds such as variable annuity funds and risk parity funds). This means that, structurally, they will increase their holdings of stocks and other risk assets when volatility declines, but reflexively dump risk assets when volatility rises. 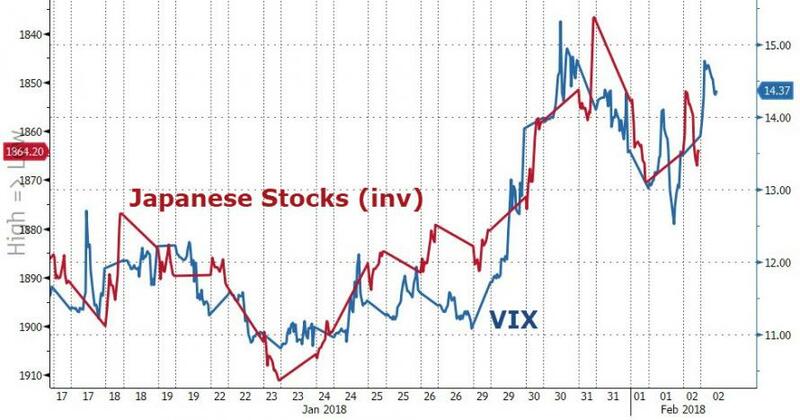 All of which suggests that if VIX keeps rising then expect Japanese stocks and Bitcoin to keep tumbling.